Let's investigate the pain in the first lumbrical due to repetitive golf swings with backswing where the support hand experience the pain. It can be repetitive injury, too weak muscles or poor technique. If you are left, then the pain is in the first lumbrical of the left hand. If you are right, then the pain is in the first lumbrical of the right hand. I first doubted "not tight enough golf grip where hands not as package" and then "not proper backswing" but this and this confirmed me otherwise. So I am still in the starting point: I cannot understand why my first lumbrical becomes painful after repetition: I am not sure whether it is because my hand muscles are not yet familiar with the stress or some other reason. First lumbrical is connected to the muscle "flexor digitorum profundus." 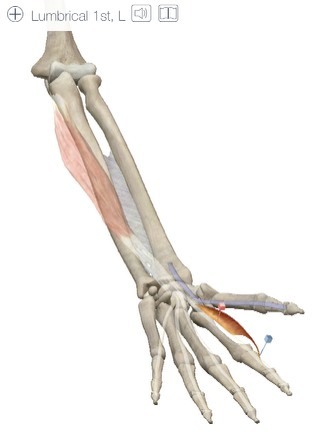 Tension in that muscle may cause pain to the hand. Poor warm-up of the hand muscles? Or some other reason? How do you alleviate the pain in the first lumbrical due to golf? How do you warm up the small hand muscles in golf? What have been the reasons for the pain in the first lumbrical with you in golf? so the club won't wobble over the lumbrical 1st during the swing, the cause for the pain. Not the answer you're looking for? Browse other questions tagged golf injuries or ask your own question.